As I’ve probably mentioned before, my mom is an excellent clipping service, regularly sending me articles and recipes from the New York Times. Sometimes she makes the recipes first herself but more often, since she is cooking for two and I am cooking for four, she sends it to me to test and see if it’s worth her effort. Usually my sister is included in the recipe exchange, too, which was particularly helpful recently, when Mom found the recipe for grilled coconut kale, and Libby made it, but suggested stir frying might be just as good, and easier. I’m here to report it is. Now kale is something that, like many greens, cycles in and out of favor with my kids. Right now, Ben likes it best raw in salad and Eli won’t touch it. But this, like Lisa’s recent braised celery, was a modified success, and I’m encouraged to keep it in the repertoire. You might find that even kids who insist they don’t like kale like it this way, tender and sweet with coconut milk. And come summer, maybe I’ll even grill it; but this time of year, I’ll stay out of the rain and make it on the stove top. I’ll link to the original recipe, but I’m also typing it in as I did it, cut down to a more family-sized amount (1 bunch of kale rather than 3). 1. Wash the kale thoroughly and cut out the stalks. Cut the wide leaves into strips the width of the small leaves. 2. In a large pot set over a low flame, heat the coconut milk until it is thoroughly mixed and just lukewarm. Transfer to a large, nonreactive bowl and add the remaining ingredients. 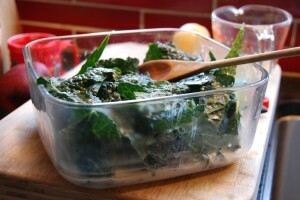 Stir in the kale, cover with plastic wrap and refrigerate for at least 4 hours. 3. Remove the kale from the refrigerator and stir to make sure the leaves are well covered in marinade. Toss in a saute pan and cook over high heat for 2-3 minutes, then cover and lower the heat. Cook until tender, another 6-10 minutes. Serve immediately. Adapted from Vij’s Restaurant, Vancouver, British Columbia.